There was singing. There was dancing. There was piano playing, bell playing, and guitar playing. There was African drumming. There was rapping and dramatic performance. There was even a performer on stilts. 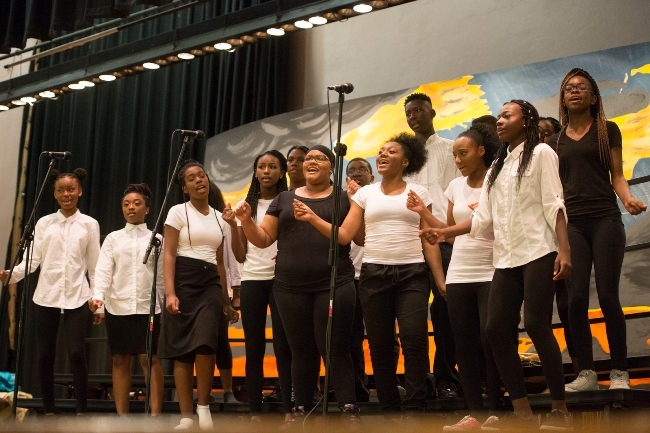 The Annual Summer Performance of the East St. Louis Performing Arts program, which took place on Friday, July 14, at East St. Louis Senior High School, had it all. The East St. Louis Performing Arts Program has quickly established itself as one of the more important arts and cultural programs in the city. Where else, beyond a school function, do you see this many people gathering together to participate in and witness performances by young, East St. Louis artists? The Performing Arts program began many years ago, but then went on hiatus for several years before returning with a summer program in 2015. This past May, the program coordinated a recital on SIUE's campus. The performance on Friday, was even larger with more than 300 East St. Louis citizens in attendance. They were primarily the friends and families of the young performers. The young people sang gospel and R & B. A few of them rapped songs by Chance the Rapper, as well as raps that they composed themselves. They did modern dance as well as traditional African dances. They also incorporated dramatic performances into those performances. Some of the students performed on guitar, piano, and bells. Students tended to participate in multiple showcases. So the young people who performed on piano also sang with the choir and later did African dance and still later danced to a medley of Michael Jackson tunes. Jesse Dixon, Executive director of the SIUE East St. Louis Center (ESLC), Jack Williams, and Mary Jo Pembrook continue to serve as the key organizers for the program. And there are others, including the various instructors such as Tyler Edler, Venezia Manuel, Ta'Shayla Montgomery, McKinley Smith, Michael Thigpen, Esau Toombs, and Gerald Babatunde' Sylla. There are also behind-the-scenes folks like Shavonda Mitchom, associate director of ESLC. More than 70 performers, from ages 6 to 17, participated in the event. Imagine for a moment the organizational expertise (and patience) that goes into coordinating such a large group of young, eager people across those age groups. 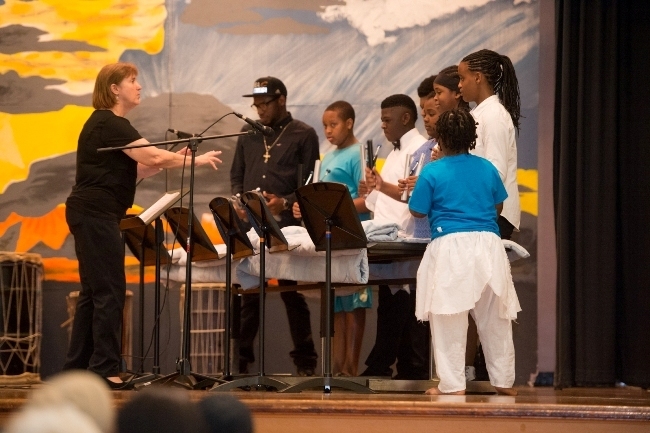 The lack of more arts programming and formal performance instructional spaces in the region make the East St. Louis Performing Arts Program and annual summer program even more significant. What is perhaps most important is how much the students enjoy themselves and how proud they are of their performances. On Friday, the audience clapped and cheered their approval during the performances. The young people were constantly being reminded that who they are and what they were doing mattered.